What Do Guests Wear to an Indian Wedding? What Do the English Wear to an Amish Wedding? What Can You Wear for a Hindu Engagement? A traditional Hindu woman attending a ceremony. 1 What Do Guests Wear to an Indian Wedding? 3 What Do the English Wear to an Amish Wedding? 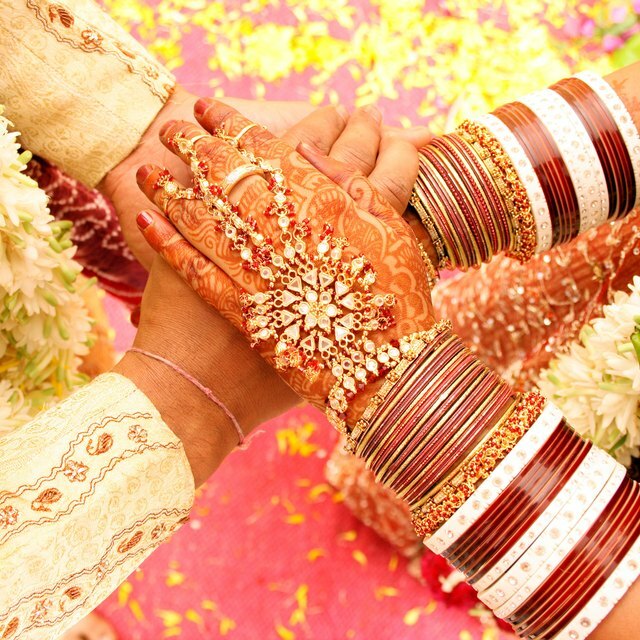 In Hindu culture, engagement ceremonies play a significant role in a couple’s relationship. Attended by the couple’s closest friends and family, the ceremony serves as a prelude to the forthcoming wedding ceremony: a first chance for the community to celebrate the love of the man and woman. During this ceremony, the two families bless the couple, who exchange rings. Guests who are not a part of Hindu culture may feel lost, especially in matters of dress. Like the bride-to-be, women who attend an engagement ceremony traditionally dress in colorful saris, long pieces of cloth draped over the waist and around the shoulders. Underneath it, an ordinary blouse is worn. Women who don’t wear this garment may, instead, wear a salwar kameez, a three-piece outfit consisting of a dupatta, salwar and kameez. A kameez is a shirt; a salwar is a pair of loose pants that tighten towards the feet; and a dupatta is a scarf-like accessory that can be worn around the head. Others may choose to wear a lehenga, which includes a blouse and a long embroidered skirt. In today’s India, on formal occasions, men typically wear a kurta pajama-like, a long-sleeved shirt that covers not only the torso but also the waist and upper thighs, stopping just above the knees. Men wear kurtas made of cotton and silk during the summer and wool during the winter. If the ceremony takes place in a temple, men may be required to wear a lungi, an article of clothing similar to a sarong or a kilt. While dressing in traditional Indian clothing is considered a sign of deep respect and solidarity for the family, outside of India, the hosts of an engagement ceremony typically don’t require this of all their guests. It’s socially acceptable for people who are not a part of Hindu culture to dress formally in clothes appropriate to their own culture. For men, this includes a suit and tie. Women may wear long skirts or pantsuits. Hindu culture encourages the wearing of accessories, which include earrings, necklaces and jewelry that complements the attire. It may also include bejeweled bangles, gem bracelets and chokers worn around the neck. In place of normal earrings, women may choose to wear jhumkas, a type of large earring shaped like a bell. Shoes should be easily removable in case the ceremony takes place in a setting such as a temple where shoes are forbidden.